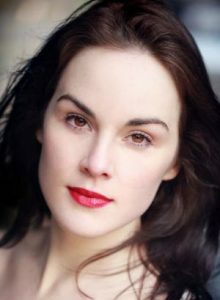 Michelle Dockery is an English television, movie and stage actress and singer. She is best known for portraying Lady Mary Crawley in the television drama series Downtown Abbey from 2010 to 2015, for which she was nominated for a Golden Globe Award and three consecutive Primetime Emmy Awards in the category of Outstanding Lead Actress in a Drama Series. In 2016, she began starring in the TNT drama series Good Behavior. In 2017, she portrayed the lead role of Alice Fletcher in the Netflix western-drama limited series Godless, for which she earned a fourth Primetime Emmy Award nomination. Her notable stage credits include Pygmalion, Burnt by the Sun, Pillars of the Community and Hamlet. In addition to her television and stage appearances, she has also acted in a number of films, including Hanna, Anna Karenina, Non-Stop, and 2015’s Self/less. Born Michelle Suzanne Dockery on December 15, 1981, at Rush Green Hospital in Rush Green, London, to parents Lorraine and Michael Dockery, she is the youngest of three children. Her siblings are Joanne and Louise. She was educated at Chadwell Heath Academy, and Finch Stage School. She also attended at London’s Guildhall School of Music & Drama. Playing the role of Jessie, she made her professional stage debut in His Dark Materials in 2004. She was engaged to John Dineen until he passed away from a rare form of cancer on 13 December 2015. *She was born in London, England, on December 15, 1981. *She was a member of the National Youth Theatre. *She is a 2004 graduate of Guildhall School of Music & Drama. *Outside of acting, she is also proficient in dancing and playing the guitar. *She is a huge fan of American jazz singer-pianist Melody Gardot. *She is friends with Sarah Solemani and Laura Carmichael.